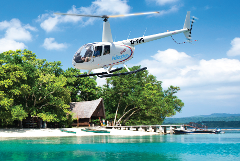 Thrilling 1000s of people every year this is the most popular tour in Port Vila! Full of amazing twists, turns and plenty of splashes. 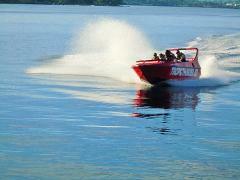 This 30 minute jet boat ride is the most exhilarating water tour in the South Pacific. EXPECT TO GET WET! Another fun combination tour, See the highlights of Vila from above with the famous “Taste of Vila” Flight and then experience the awesome power of the V8 Jet Boat. The 3 best tours operators in Vanuatu have come together to bring you the Ultimate Thrill Seekers Combo. Only available online this is the best deal you will ever get. Helicopter, Zipline and Jet Boating. A fantastic combo for the family. Adventure in the tress and adrenalin on the water. Book early to avoid disappointment. 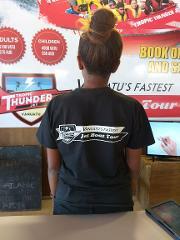 Both tours are highly recommended and can only be booked online. 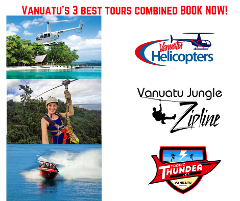 Vanuatu Jungle Zip line and Tropic Thunder Jet Combo. Free shipping or pick up on the day. Grab one of our Tee Shirts for only $25.